On the release of her new book Louisiana’s Way Home, Kate DiCamillo reveals why she returned to the story of Louisiana, the difficulties of writing in the first person and why she is drawn to small towns. What about Louisiana’s character or voice called you back into her world? Louisiana is one of those characters whose voice I hear. Sentences in her voice would pop up here and there in my journal, and I thought: There is so much about Louisiana that is mysterious. What if I follow that voice? What will I find out? What about the arc of Louisiana most surprised you as her story unfolded — any unexpected character discoveries or development? This book is the first you’ve written in the first person since Because of Winn-Dixie. Can you tell us how this story lent itself to that or why you made that decision? Yep. I struggled for quite a while not to tell it in first person. First person is a high-wire act. One small misstep and you fall. When I wrote Because of Winn-Dixie, I didn’t know that. It was my first book and I was just kind of puttering along. I didn’t know how impossible it is. So, with all of that said . . . I tried to tell Louisiana’s story every way except for first person, and she just wasn’t having it. She wanted to tell it. And so I stepped out of her way and followed her voice. Louisiana’s Way Home starts as sort of road trip caper, but quickly transitions into a more intimate small-town setting. What continues to inspire you to write about the quaint but sometimes stifling dynamics of the small-town South? Well, I grew up in the small-town South. It’s where the world came into focus for me. It’s where I learned about storytelling and (in the infamous words of Blanche DuBois) the kindness of strangers. Burke becomes an unforgettable character from the moment he steps onto the page — what was the genesis for him and how does he counter Louisiana’s despair? Oh, I love it when Burke shows up — standing up there on the roof of the hotel. What was the genesis for him? I don’t know. He surprised me just as much as he surprised Louisiana when he showed up on that roof. It is one of the great gifts of storytelling — to have a character like that suddenly appear. Burke offers Louisiana genuine, uncomplicated friendship. But more than that, he is a child who has been loved completely and well — by his mother and his father and his grandfather. He has kind of a radiant wholeness that counters Louisiana’s despair. Louisiana has an insatiable hunger for life and love and food — all of which are in limited supply during the foray to Georgia with Granny. Granny is another hard example in your books of how adults can let kids down, even when they are well meaning. Have you ever thought about how Granny simultaneously fills these kinds of soul holes inside Louisiana and also perpetuates them? Yes, I have thought about that. But only out of the corner of my eye. I can see it most clearly when I consider Burke Allen, and that love that he received from his family, and how it compares to the love that Louisiana gets from Granny — which is more complicated, fraught, loaded. But Granny loves her, there is no doubt about that. And she sees that Louisiana has a gift, and she teaches her out to use that gift. And that is no small thing. The animal character that flies into Louisiana’s life is the crow. A crow is a pretty unexpected sidekick or pet and usually bodes darkness and bad things to come. You turned this common symbolism on its head, and he became a beacon of hope and family and friendship — please discuss. Crows fascinate me. Delight me. They are so smart. They clearly have a sense of humor. Also, they seem like storytellers to me. My heart lifts up every time I see one. I’m surprised that it has taken so long for a crow to appear in one of my stories. But it also makes perfect sense that it would be Louisiana’s story that has a crow — something about the light on the darkness. I know you don’t look at all toward central questions or themes when you are writing your books, but if you reflect on this character’s journey now that the final pages are complete, do you see any kind of pattern in this particular story that might fit into the Kate canon? Ha. I will let the critics tell me what the pattern is. But I can tell you that the title Louisiana’s Way Home alone has one of my thematic concerns — every story I tell is an attempt to find my own way home. If you were ever in a cake raffle contest, what would your ultimate dessert win be? Well, I sure do love cheesecake. But more than anything else, like Louisiana, I just love the idea of winning a cake. The list is too long. I wouldn’t even know where to begin. Okay. Vacuum under the bed, please! 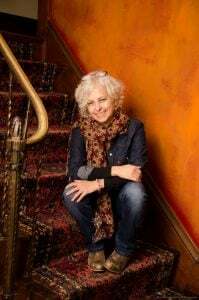 Kate DiCamillo was born in Philadelphia and moved with her family to Florida when she was five years old. In her twenties, Kate DiCamillo moved to Minnesota. It was this dislocation from her home that inspired Kate to write her first novel, Because of Winn-Dixie. An immediate commercial and critical success, Because of Winn-Dixie went on to become a Newbery Honour Book in 2001 and was subsequently made into a film that was released in 2005. 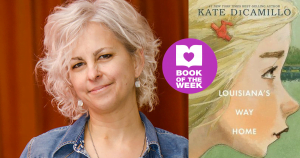 But that wasn’t enough for Kate, and she went on to win the Newbery Medal in 2004 for her book The Tale of Despereaux, a story about an unlikely hero. This was followed by another unusual tale with The Miraculous Journey of Edward Tulane, a story about a china rabbit who learns about love. Kate has also written a series of early chapter-book readers about a lovable pig named Mercy Watson and her fun adventures. Kate lives in Minneapolis, where she faithfully writes two pages a day, five days a week.